I’m not sure if it’s the music that draws me in or that I’m entranced by the magificent tree that sits in the coolly lit alcove. 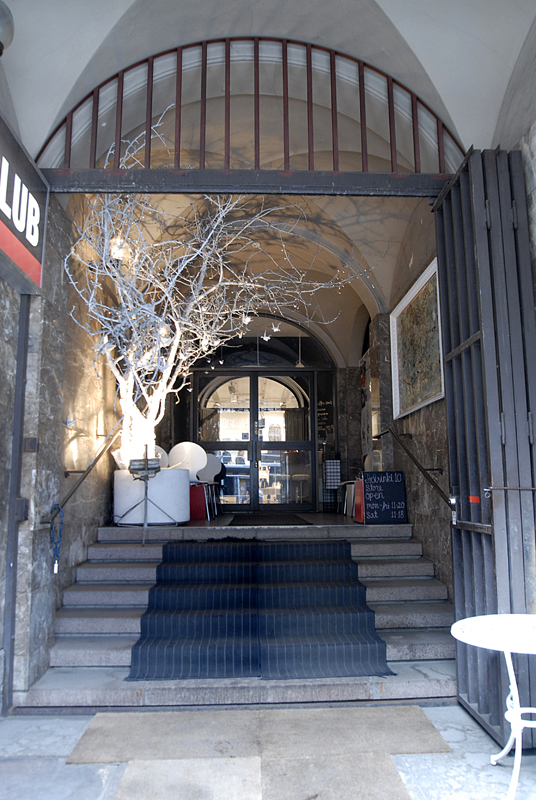 Regardless, I can’t resist climbing the steps into this fantastic place that is Helsinki 10. The space itself is a striking palette of black, white and grey. Accented by bold graphics, stunning installments, architectural detail, amazing clothes and an eclectic collection of accessories, books, music and other cherry picked objets d’art. Close my eyes and I’m in another city. Maybe NY. Maybe LA. Maybe Berlin. Actually, it doesn’t matter as I could happily melt right into this comfy white chair…not knowing completely where I am…but enjoying every moment of the music and the people watching. The clientele is a mix of fashionistas, street kids, modern punks, foreigners and Finns. And somehow there is a gritty and unusual gorgeousness to everyone who sets foot through the doors and they seamlessly form a part of the ambience. A short time here and you’ll quickly discover the ’other side’ of Helsinki…a distant cry from the mainstream shops that line Aleksanterinkatu on one end and the handicraft shops on the other. The masterminds behind this sensorial shopping experience are Anssi Heiskanen (the store’s designer, resident artist, TV producer, marketer – a modern renaissance man) and his partner of some 20 years, Eeva (the head of buying and all around style guru). Together they’re an amazing team, who have established Helsinki 10 as a hub of style and creativity since its doors opened 5 years ago. Today, I’m lucky enough to have gotten a few moments of their time. We’re sitting in a space that’s part coffee bar and part lounge. Next to us is a floor to ceiling relief sculpture designed and crafted by Anssi and across the table is a flat screen tv streaming a surreal yet captivating show of work by Danish fashion designer, Henrik Vibskov. This is one of my favorite shops in Helsinki. Can you share with me your vision? Anssi: We never set out to be just about Finnish fashion labels or even Scandinavian labels…but I believe that we’re truly a Scandinavian store. 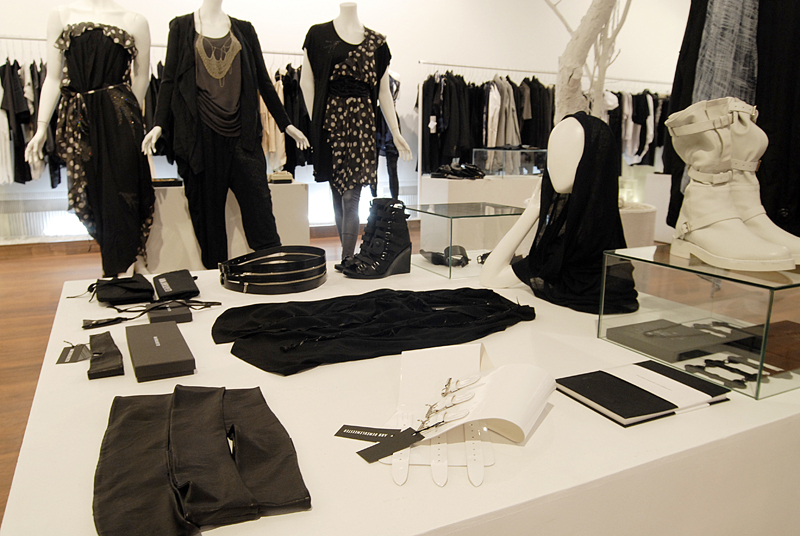 Mainly because we buy brands that cater to the tastes of our local clientele who are all about mixing labels and styles. We first look at what’s happening in Helsinki…attitudes, trends and culture…and then we look at the rest of the world…and we bring the two together. We don’t want the store to be defined by a particular product or brand, but rather to have a store that reflects the times we live in…in other words a continuously developing entity. AS: I’ll never forget the first time I walked through these doors and I saw these incredible Ann Demeulemeester boots and thought wow…..I’ve landed in Helsinki shopping heaven. You carry a truly distinctive collection. Tell me about the labels. Eeva: Well…we’ve got 150 labels that we’re featuring now. They’re all carefully hand picked. Some large international names and some really small. We like to rotate the smaller labels. We’re lucky in that we’ve been able to get brands and designers that have not had a presence in Finland before and we have exclusive rights to sell their products. Also because we hand pick every item we sell (as opposed to buying a label’s full collection) we find we carry a very unique range of products as compared to other local shops who might carry the same brand. AS: I’ve lived in Helsinki now for 10 years and in this time have seen Helsinki style, fashion and shops go through what I would consider a pretty radical transformation. You both have lived here for your lives, what are your observations? Eeva: Anssi and I started working together in the 80’s. 1983 to be exact. At that time the labels here came exclusively from Finland and there was not that much innovation happening. As a result, we looked to Sweden , Denmark and Norway and we learned much from the trends and concepts developing there. It was in the mid-90s when Finland really started to think about fashion and style concepts and it was at this time that we opened our first concept store. It was called Union 5 and it was our first effort at connecting different styles and labels to create a unique shopping experience. It definitely had more of a street wear orientation. But then we spent some time in LA, and other international style capitals, and saw what was emerging there on the fashion/style scene and realized that we needed to bring to Helsinki what we saw as upcoming trends (two years out) from the international scene. AS: Ah ha, so this was the catalyst to the famous ’14 oz Sessions’? Anssi: I guess you could say we wanted the wake up the Finnish media to the trends and designers emerging elsewhere in the world and we used these happenings to do just that. The idea was that every two years we’d host an event where we’d bring some of the most exciting designers to Finland. By 2005, this had grown into something way beyond our belief and maybe a bit away from our DNA. It grew to more of a fashion trade fair and as a result 2005 was our last big event. 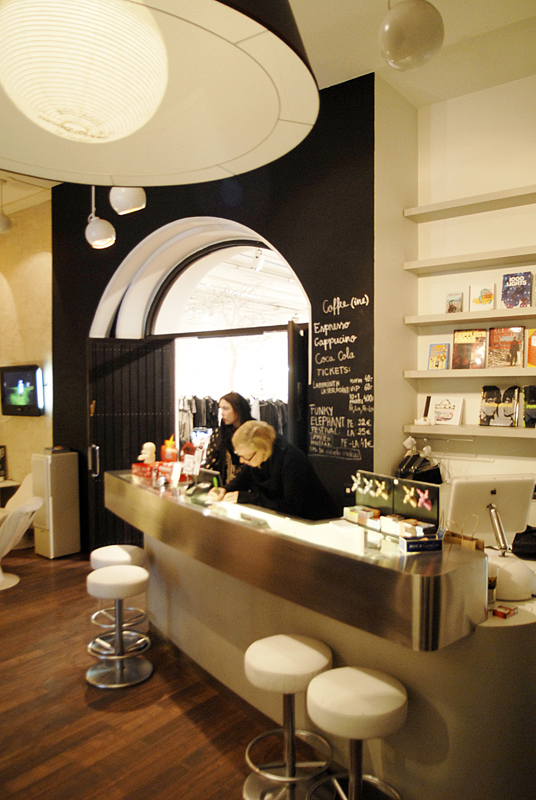 In May 2006, we launched Helsinki 10 and now we host regular happenings right here in our store with a more intimate feel. I’m happy say that we’ve got something exciting planned for the near future. AS: So where do you see the most innovation happening now and where do you look for your inspirations? Anssi: NY is really fantastic now and there are also some amazing designers out of London. We’re also looking closely at Russia to find new talent and emerging trends to bring to the store. AS: Henrik Vibskov…the show looks fantastic. Do you know him? Eeva: Yes, we actually know him well and have attended all of his shows (well except this one). They’re fantastic and we carry his designs in the shop. AS: I’ve spent some time in the store people watching and have my own observations, but how would you describe your customers? Anssi: Ageless. Sure we get young adults who are into design and fashion but we have no intention of restricting the appeal of the store and you can see that in the people coming in. It’s more about a personal style philosophy and attitude vs your age in physical years. AS: How would you describe Helsinki? Anssi: Helsinki’s a small city but with a big city feel in many ways. So many styles and experiences that come from abroad. You move abroad for school, work, or just for fun and when you come back (which happens a lot) everything you’ve experienced comes back with you and it makes for a very dynamic place. Helsinki now? There’s always something happening that’s totally new. AS: Your favorite haunts in the city? Anssi: My favorites are just about anything along the seaside. It’s just a different vibe. Cafe Regatta is great. The owners have a great humor which you see when you look around the small cafe’s interior. It’s filled with really quirky Finnishness that always makes me smile. I also love the old buildings aroud the city and the more I travel, the more I appreciate the beautiful architecture that we have right here in Helsinki. There’s been so much renovation over the past few years that I feel like I’m seeing the true beauty of some of buildings for the very first time. And while you’re in the neighborhood…here are some other favorites. Paloni – a pint-sized, yet totally creative design concept store selling pieces that are crafted by over 70 independent designers from around the globe. Address: Eerikinkatu 7 Map here. Kitch eat/drink – we love this little neighborhood place for well-priced tapas, salads, burgers, pasta. Address: Yrjönkatu 30. Map here. Hotel Torni/Atelje Bar – Climb to the tiny yet bustling Atelje Bar for cocktails and the best views of the city. Address: Yrjönkatu 26 Map here.